For most readers, holding this new edition of The Church of God represents their first encounter with Stuart Robinson. By comparison, the major contributors to the ongoing discussion of Presbyterianism are readily recognized: the cornerstone Calvin, the Socratic Turretin, the erudite Bavinck, and the inexhaustible Bannerman. Thornwell defended church power in theory, but Robinson defined it in particulars. Hodge traveled the landscape of ecclesiology extensively, but Robinson traversed its terrain proficiently. Bannerman expounded Presbyterianism comprehensively, but Robinson explained it concisely. Although one can understand why historians give more attention to better known thinkers, Robinson was regarded as an equal among and by his contemporary Presbyterian ecclesiologists. He should be given his due when discussing the area of his recognized strength. In recent years, ecclesiology (the doctrine of the church) has surged ahead of other loci of theology. Many works on ecclesiology have appeared in the developing academic areas of comparative and historical ecclesiology and in the ever-expanding postmodern theologies, particularly the Emergent wing. But not all of these contributions can be regarded as enriching. Despite apparent efforts to revive an ancient faith, some contemporary ecclesiologists betray an eclectic historical consciousness that tends to skip over the Reformation. Inserting The Church of God back into the ecclesiological narrative helps to address the existing need to become better acquainted with what has been said before—and, above all, with what has been said wisely. Where some have seen weakness, Robinson saw strength. Calvin wedded his doctrine of the church to the doctrine of predestination. Some have viewed this as a serious ‘methodological error.’ But Robinson viewed it as a brilliant insight…In the unsearchable counsel of the triune God, the ‘ideal church’ lies anterior to the ‘actual church’ in the history of redemption, preeminently in the Abrahamic covenant. Reformed ecclesiology has been powerful and united because it has insisted on seeing the church in the big picture, through the perspective of God’s eternal decree, and consequently in the sweep of redemptive history. Taking this ‘ideal’ angle inevitably led Robinson to stress the centrality of Christology in ecclesiology and Christ’s ongoing ministry in his threefold office. Is it a scowl of anger or grimace of pain that is on the face of Stuart Robinson? His appearance may very well be due to pain. When he was an infant, his nurse was tossing him in the air, as adults often do, and watching him giggle, as babies will do, but then she accidentally missed him and he fell to the floor. One can only imagine the horror of the nurse as she saw the child she cared for screaming in pain. The injuries were fearful. His right shoulder was dislocated, his hand and thumb were seriously injured, and his head was injured such that the doctor believed, using the terminology of the day, “idiocy,” might be the result. Robinson recovered from his head injury but his arm and hand were disabled for the remainder of his life manifesting a stiffness and awarkdness that could be seen in his gestures in the pulpit. Matters were made worse when he broke the same arm in an accident while riding a train from Baltimore to Kentucky. Yes, his facial appearance may very well be due to pain, but then there is the possibility of the scowl of anger, an appearance of antagonism because his character, integrity, and honor as a man and a minister had been assailed and slandered such that he sued the source of the defaming words. Stuart Robinson was of Scotch-Irish stock, born November 14, 1814, to James and Martha Porter Robinson in Strabane, County Tyrone, Ireland. Martha was the daughter of an elder in the Irish Presbyterian Church and her grandfather had been a Presbyterian minister. Stuart’s father was a successful purveyor of linen until he lost his wealth through guaranteeing some loans that did not work out. Thus, as so many residents of Ireland were doing in the era, James took the family first to New York and then to Virginia where they settled. When Stuart was but six or seven years old his mother died. The household had no relatives in the country, so Stuart lived with another family, the Troutmans, through arrangement by his father. The Troutmans raised Stuart as their own and realilzed his intelligence. They saw that he attended school. As with several of the biographical subjects presented on Presbyterians of the Past, Stuart had an incredible memory. The Troutmans sought the advice of their pastor, Rev. James M. Brown, who recognized the thirteen year old’s abilities, took him into his home, and directed him in his studies until he continued his work in the academy in Romney, Virginia, mastered by Rev. William H. Foote. At about the age of sixteen during his preparatory studies he professed his faith in Christ. When it was time to enter college, young Stuart entered with the freshman class at Amherst in Massachusetts, completing his program in 1836; he then studied one year in Union Seminary, Virginia, after which he taught for two years; and then he completed his studies at Princeton Seminary in two years. Stuart Robinson was licensed by Greenbrier Presbyery, 1841, then ordained, October 8, 1842, at Lewisburg, Virginia (currently in West Virginia) to serve the Kanawha Salines Church. He continued in the ministry serving churches in Kentucky, then Baltimore, and then moved back to Kentucky where he taught in Danville Seminary. Stuart Robinson was known for his preaching gifts, the precision of his sermons, his pointed and no holds barred writing, and a short-fused temper. His memorialist, J. N. Saunders, commented that, “his temper sometimes got the better of him; that his great will was sometimes too imperious, and that he often said things that were unnecessarily severe and wounding” (p. 34). At the time of the lawsuits that will be discussed in the following paragraphs, Robinson had been the minister of the Second Presbyterian Church, Louisville, since 1858. The story of Dr. Robinson’s litigation begins with The Hickman Courier of Hickman, Kentucky, which reported in March 1872 that an important libel suit had been filed by Rev. Stuart Robinson against the proprietors of the Chicago Evening Post seeking damages of 100,000.00. The compensation sought was described as, possibly tongue in cheek, “a moderate sum.” Robinson was responding to a thirty-one word piece run that January in the Post’s “Personal and Impersonal” column. Rev. Stuart Robinson of Louisville, who advocated from the pulpit during the war, the shipping of yellow fever infected clothing to Northern cities, narrowly escaped death from small pox last week. The purpose of the paragraph was likely to inform the Post’s readers of Dr. Robinson’s illness. Despite the availability of an early type of vaccination, the “pox” was a common disease of the day that sometimes horribly scarred the victim’s face. It is believed that the ghostly appearance of Queen Elizabeth, I, of England in her portraits is due to heavy makeup covering her small pox scars. The libelous portion of the piece was the comment that, expressed in a matter of fact manner as though it was common knowledge, Robinson had recommended from the pulpit that the Confederacy engage in what would be called today germ warfare by distributing yellow fever in the North. Could it be that the between-the-lines purpose of the snippet was to interpret Robinson’s small pox as a divine judgment for his alleged yellow fever plan? One can only imagine the response of Stuart Robinson when he read the slanderous words given the struggles he had controlling his Scotch-Irish ire as he grew in grace and sanctification. The Chicago Evening Post had pursued an investigation into the facts and was “able to speak intelligently in reference to both” the yellow fever plan and Stuart Robinson’s character. The Post had determined that one Mr. Conover was the source of the accusation and that it was “utterly without foundation in fact.” Another slice of humble pie was eaten by the Post as it went on to praise the character and integrity of Robinson saying he was “a Presbyterian clergyman of national reputation….For integrity, ability, and all those qualities of head and heart which adorn the profession, he stands second to few clergymen in the country.” Further, Stuart Robinson had shown his generosity and compassion for the people of Chicago the previous year by giving 1,000.00 to the relief fund for victims of its cataclysmic Great Fire. The Post continued noting that the comment had been added to its “Personal and Impersonal” column from another paper, the name of which is not mentioned. No Post editor had reviewed the piece before its publication. The Post’s confession ends with sorrow, penitence, and a touch of justification for its mistake. It is the duty of a newspaper to expose and denounce wrong in whatever station or profession it may be found, but no editor can supervise all the items which will creep into his columns. Injustice is thus sometimes done, but the Chicago Evening Post has made it an invariable rule, voluntarily and without condition, as far as possible, to repair the wrong. In this case, we are sincerely sorry for the publication of this item. We take pleasure in retracting it, and, that no injustice may be done to the party, we hope other papers which copied the items will give the retraction a circulation as extensive as the charge. What a nightmare for Dr. Robinson. In the nineteenth-century a newspaper often copied the reports of other papers and used them for their own articles. Sometimes the source was cited, but in many cases the source was not mentioned. It was not seen as plagiarism but rather an informal wire service among publishers. If a New York newspaper copied an article from an Atlanta newspaper reporting a theater fire in Decatur that killed twenty people, then it was the accepted practice to reprint it as its own and no one thought anything about it. When an article was borrowed from another newspaper it was hoped the source from which the account was copied had provided accurate information, but obviously, this was not always the case. Thus, not only did the Chicago Evening Post publish a lie about Robinson, but each newspaper that used the article spread the defaming information. One might think of newspapers sharing articles as similar to the Internet when posts are copied and pasted, or linked from one site to another. Just as with the newspapers, the Internet information may or may not be accurate. As commented above, the Chicago Evening Post did not name the newspaper from which it had obtained the Robinson article. It could be that the unnamed paper was published in St. Louis. The Hartford Herald of Kentucky, five years after the defamatory piece was published in the Post, reported that a judgment for slander had been made against “the old St. Louis Democrat.” The amount awarded Robinson was 30,000.00, which circa 2014 would amount to over a half million dollars according to computation using the history of the index of inflation. This substantial judgment against the Democrat was just one of a number of suits, including the Chicago one, that was filed by Robinson and in each suit he was “vindicated by the courts.” If the judgments for Robinson were all at the level of the Democrat award, then the already wealthy Robinson would have seen his bank account enhanced tremendously. What is to be learned from the disconcerting experience of Stuart Robinson? Obviously, one living in his day would have recognized that defaming Dr. Robinson could be a financially costly mistake. The Epistle of James reminds Christians that the tongue is a fire that can burn out of control (3:6), it is like the tiller of a ship in that its movement directs the whole person (3:4). A more modern but uninspired analogy is that words are like bullets fired from a gun in that once they go forth, they cannot be taken back, but even though words cannot maim and kill like bullets they can certainly anger, dishearten, or crush the one at the receiving end. It is doubtful that the one who began the lie, Mr. Conover, would have been concerned about his tongue because at the time the Chicago Evening Post investigated his accusation against Stuart Robinson, he was reported to be in prison for perjury. The reason for his perjury conviction is not given and it may or may not have been associated with the Robinson suits. Stuart Robinson continued his ministry at Second Church, Louisville, until he was released from his call in June due to declining health. He died from stomach cancer, October 5, 1881. Dr. B. M. Palmer led his funeral service two days later. Dr. Robinson had served as moderator of the General Assembly of the Presbyterian Church in the United States (PCUS) in 1877, and spoke in the sessions of the Pan Presbyterian Council in Edinburgh, Scotland. He was honored with the Doctor of Divinity by Centre College, Danville, Kentucky, 1853. He was survived by his wife, Mary Eliza, daughter of William Brigham, M.D., and their two daughters; two sons had died before Dr. Robinson’s death. He was buried in Cave Hill Cemetery in Lousiville. If interested in reading more about Stuart Robinson see, A Kingdom Not of this World: Stuart Robinson’s Struggle to Distinguish the Sacred from the Secular during the Civil War, Mercer, 2002, by Preston D. Graham, Jr., which provides a fine intellectual biography with particular emphasis on the doctrine of the spirituality of the church. Also, Robinson’s book, The Church of God as an Essential Element of the Gospel, 1858, has been reprinted by the Orthodox Presbyterian Church, 2009, and it includes a twenty-five page biography by T. E. Peck who was a friend of Robinson and his successor at Central Presbyterian Church, Baltimore. Robinson also published Discourses on Redemption: As Revealed at Sundry Times and in Divers Manners, Richmond: Presbyterian Committee of Publication, 1866. The Origin of Paul’s Religion (1921) is perhaps Machen’s best known scholarly work. This book was a successful attempt at critiquing the Modernist belief that Paul’s religion was based mainly upon Greek philosophy and was entirely different from the religion of Jesus. Machen writes a masterful and forthright defense of the historical truthfulness and supernaturalism of the New Testament. This volume is taken from the James Sprunt Lectures delivered at Union Theological Seminary in Virginia. Reprints of this book sometimes add the subtitle “The Classic Defense of Supernatural Christianity”. Machen refutes the anti-supernaturalism that was beginning to dominate the church in the early decades of the twentieth century. Although written 85 years ago it remains a model of biblical scholarship and warm piety. John Gresham Machen, (born July 28, 1881, Baltimore, Maryland, U.S.—died January 1, 1937, Bismarck, North Dakota), was born to a prominent family in Baltimore. Machen studied at Johns Hopkins University, Princeton Theological Seminary, and the universities at Marburg and Göttingen. In 1906 he joined the faculty of the Princeton Theological Seminary. He criticized liberal Protestantism as unbiblical and unhistorical in his Christianity and Liberalism (1923), What is Faith? (1925) and struggled to preserve the conservative character of the Princeton Theological Seminary. Machen defended the historical reliability of the Bible in such works as The Origin of Paul’s Religion (1921) and The Virgin Birth of Christ (1930). He left Princeton in 1929, after the school was reorganized and adopted a more accepting attitude toward liberal Protestantism, and he helped found Westminster Theological Seminary in Philadelphia. His continued opposition during the 1930s to liberalism in his denomination’s foreign missions agencies led to the creation of a new organization, The Independent Board for Presbyterian Foreign Missions (1933). The trial, conviction and suspension from the ministry of Independent Board members, including Machen, in 1935 and 1936 provided the rationale for the formation in 1936 of the Presbyterian Church in America, which became the Orthodox Presbyterian Church (OPC) in 1939. Machen was the principal figure in the founding of the OPC if for no other reason than that the Presbyterian controversy in which he played a crucial role provided the backdrop for the denomination. In the spring of 1927, Dr. J. Gresham Machen delivered the Thomas Smyth Lectures at Columbia Theological Seminary in Decatur, Georgia, about the virgin birth of Christ. The content of these lectures comprise the substance of his book, The Virgin Birth of Christ, which was first published in 1930 by Harper & Row Publishers, and reprinted seven times with special permission between 1965 and 1980 by Baker Book House. Additional supplementary material was also drawn from a number of Machen’s articles published in the Princeton Theological Review—”The Virgin Birth in the Second Century,” “The Hymns of the First Chapter of Luke,” and “The Origin of the First Two Chapters of Luke,” which appeared in 1912, and “The Integrity of the Lucan Narrative of the Annunciation,” which appeared in 1927. The first eleven chapters attempt to demonstrate that the virgin birth of Christ is a historical fact, and defends the character of the birth narratives in Matthew 1 and Luke 2 as authentic and reliable witnesses thereto. In chapters twelve through fourteen, he interacts with the competing claim that the idea of the virgin birth of Christ was derived from Jewish or pagan sources and only later added to the Christian creed. In his second preface, Dr. Machen expresses encouragement by many affirming interactions with critical Protestant scholars who valued his work, despite their disagreement, as at least a useful “compendium of information.” “The author is encouraged by such recognition, since he believes that truth is furthered by full and open debate” (page vii). This work exemplifies a depth in Evangelical scholarship which is so often dismissed by skeptical and critical scholars, and Dr. Machen “makes bold to think that the scholarly tradition of the Protestant Church is not altogether dead even in our day, and he looks for a glorious revival of it when the narrowness of our metallic age (of modernist liberalism) gives place to a new Renaissance” (page x). John Gresham Machen, (born July 28, 1881, Baltimore, Maryland, U.S.—died January 1, 1937, Bismarck, North Dakota), was born to a prominent family in Baltimore. Machen studied at Johns Hopkins University, Princeton Theological Seminary, and the universities at Marburg and Göttingen. In 1906 he joined the faculty of the Princeton Theological Seminary. He criticized liberal Protestantism as unbiblical and unhistorical in his Christianity and Liberalism (1923), What is Faith? (1925) and struggled to preserve the conservative character of the Princeton Theological Seminary. Machen defended the historical reliability of the Bible in such works as The Origin of Paul’s Religion (1921) and The Virgin Birth of Christ (1930). He left Princeton in 1929, after the school was reorganized and adopted a more accepting attitude toward liberal Protestantism, and he helped found Westminster Theological Seminary in Philadelphia. His continued opposition during the 1930’s to liberalism in his denomination’s foreign missions agencies led to the creation of a new organization, The Independent Board for Presbyterian Foreign Missions (1933). The trial, conviction and suspension from the ministry of Independent Board members, including Machen, in 1935 and 1936 provided the rationale for the formation in 1936 of the Presbyterian Church in America, which became the Orthodox Presbyterian Church (OPC) in 1939. Machen was the principal figure in the founding of the OPC if for no other reason than that the Presbyterian controversy in which he played a crucial role provided the backdrop for the founding of the denomination. Robert King Churchill was born in Yarmouth, Nova Scotia, Canada on September 11, 1903. He became a naturalized citizen of the United States during his first year as a student at Westminster Theological Seminary in Philadelphia, Pennsylvania. In 1936 he graduated from that institution and soon thereafter was one of a group of young men ordained to the gospel ministry by the First General Assembly of the newly formed Presbyterian Church of America (later named the Orthodox Presbyterian Church). He served in that church until the time of his sudden death on September 20, 1980. Churchill labored as missionary pastor in Berkeley and Sonora, California; Roswell, New Mexico and Amarillo, Texas. He pastored Calvary Orthodox Presbyterian Church in Cedar Grove, Wisconsin from 1948 to 1959. He was always interested in young people and conducted off-campus classes with university students during his years in Berkeley and was also active in working with young people at various camps and conferences. He served on the board of trustees of Westminster Seminary for more than 30 years and represented the seminary for almost two years as field representative. In heart and life Churchill echoed the cry of the apostle: “Woe is me if I preach not the gospel.” He delighted unceasingly in the “Marvelous grace of our loving Lord—grace that is greater than all our sin.” He was zealous for the whole cousel of God and had to proclaim it. But his awe before the majesty of our sovereign God did not stop at the wonders of redeeming grace: he heard the heavens declare the glory of God and reveled in the display of his handiwork in nature—in ocean, clouds, trees, hills, the green earth and its fruit. He heard the whole creation shouting “Glory!” But most of all he rejoiced in the songs of Zion and loved to lead the people of God in singing his praises. 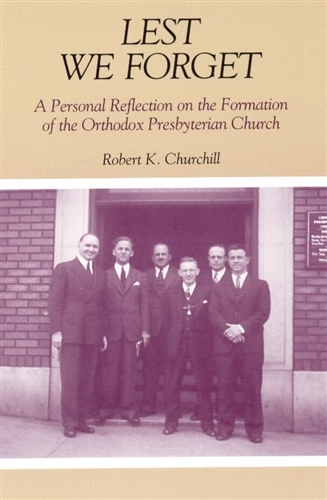 Robert K. Churchill was ordained in 1936 at the First General Assembly of what was to become the Orthodox Presbyterian Church. His life spanned more than four decades in the new denomination. As a pastor, missionary, and youth-worker, he was vitally involved in the inner workings of the OPC and a passionate defender of its cause. Thus his reflections on the formation and history of the church are a treasure that we should not soon forget. Refusing to give to another the worship that is due to God alone, the Rev. Bruce F. Hunt was imprisoned in the final two months leading up to Pearl Harbor by the Japanese forces occupying Manchuria for his open opposition to the government’s attempt to force emperor-worship on the Korean-speaking Christians among whom he labored. Taken by force from his house in Harbin while his family looked on helplessly, this Orthodox Presbyterian missionary turned down offers of an early release from prison rather than be found missing from the post to which he believed his Lord had sent him. “Hunt’s love for Christ shines forth on every page. This is not an ordinary book but here is the fascinating account of one who, even in severe trial, was faithful to his Lord. It is a book that all Christians should read, and if non-Christians would read it, they might come to understand the secret of such a life” (E. J. Young). For A Testimony is Hunt’s account of God’s grace to him during his imprisonment, as he, by that grace, endeavored to remain faithful to the end. Preaching the gospel to his tormenter guards, through the cold of the Manchurian winter and amid the disease, stench, starvation, degradation, and insanity of prison life that broke other prisoners around him, Hunt’s testimony is an encouragement to all who are undergoing trials of their faith. 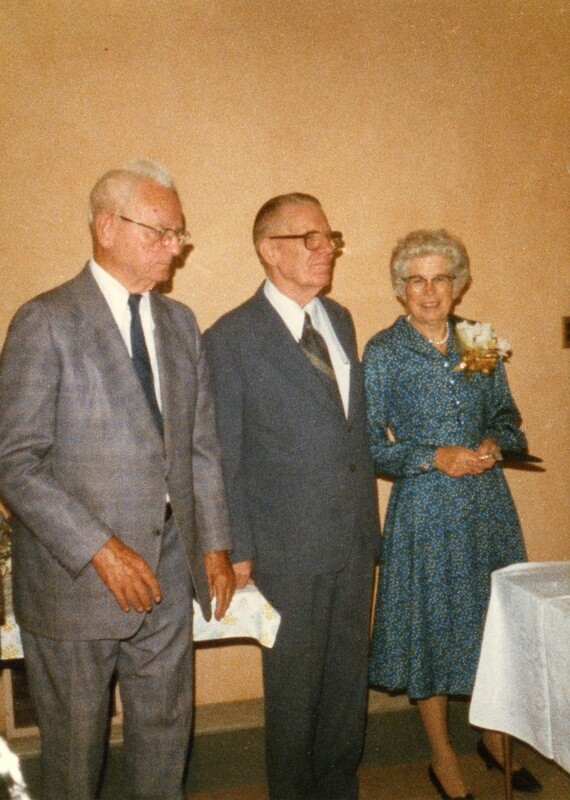 Fourteen months after Bruce Hunt was born to missionary parents in Korea in 1903, a baby named Katherine was born in the same place to first-generation Korean missionaries in 1904. Twenty-eight years later Bruce and Kathy Hunt were married on [September 27,] 1932. During the intervening years, Bruce, a senior at Rutgers University, worshipped with his family at the church where Dr. Gresham Machen was stated supply. Challenged by Machen, Bruce went on to Princeton Seminary. In 1928, he was ordained and appointed as missionary to Korea by the Presbyterian Church in the USA. While in Korea, he renewed his acquaintance with Katharine, who was teaching at the same school they attended as children. They married in the gymnasium of that school. During a furlough in 1936, Bruce withdrew from the PCUSA and became a charter member of the OPC. In 1936, the Hunts returned to Korea under the Independent Board of Presbyterian Foreign Missions. Two years later, they became the sixth missionaries of what is now called the Orthodox Presbyterian Church, serving in Japanese-controlled Harbin, Manchukuo (Manchuria). 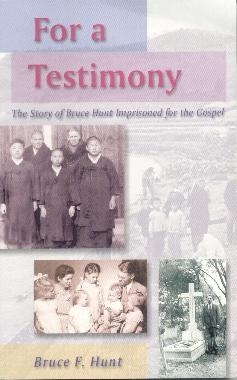 On October 22, 1941, Bruce was arrested and imprisoned for 45 days because he effectively encouraged Koreans in Korea and Manchuria to refuse to bow to the idolatry of worship in a Shinto shrine. He was released briefly but rearrested after the Japanese attack on Pearl Harbor and remained in prison until the summer of 1942. During his imprisonment, funds were cut off from the U.S., leaving Katharine the difficult challenge of providing food and lodging for herself and their five children in enemy territory. The story of his seven months in prison and a concentration camp are told in his book, For a Testimony. Once released, the Hunts spent the remainder of World War ll in the U.S., where Bruce served as stated supply and as an OP home missionary in California. In 1946, Bruce returned to Korea as a faculty member of the new Korea Theological Seminary while Katherine and the children stayed in the U.S. until they received permission to return two years later. During the Korean War, they again were separated for one and a half years. Until Bruce retired in 1976, they helped to develop the Missionary Training Institute which trains Koreans as foreign missionaries. Bruce received his eternal rest on July 26, 1992 and Kathy on December 8, 1994.